Holmes and Houdini set out to save Sir Arthur Conan Doyle from fraudulent psychics. Here's another Sherlock Holmes pastiche from the fertile pen of Val Andrew. Again two areas of mystery are linked: the exploits of Shelock Holmes and the secrets of master escapologist, Harry Houdini. 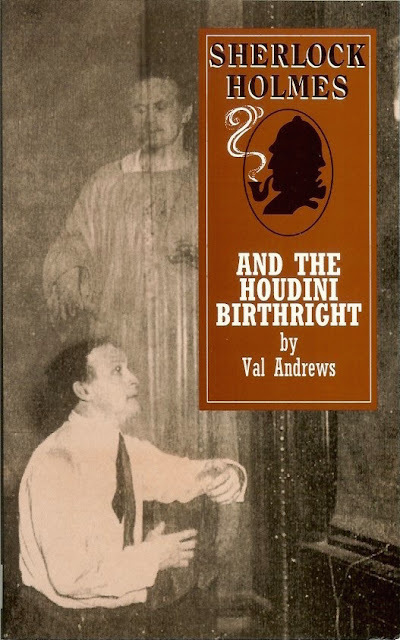 Doctor Watson's collaborator, Sir Arthur Conan Doyle, finds himself drawn into the world of fake psychics and Houdini is anxious for Holmes to unmask the perpertrators who prey on the innocent t believers. Once he has been torn away from his beekeeping activities, Holmes's investigations lead him to some surprising locations including a Ruritanian castle. Sherlockians, historians and magic buffs will all be intrigued and delighted with this classic detective story which links fact and a little fiction to suggest what may have happened to Houdini after death. Again .... the game is afoot.